I’ve done aquaponics – which is basically using fish to fertilize the water you use to grow plants hydroponically – out of the Battlestar before but this is the first time I’ve done a fruiting plant. I had a volunteer cherry tomato show up in my back garden thanks to throwing moldy tomatoes out for the squirrels. It got nice tomatoes on it before the end of the season so I decided to take a couple of cuttings and try growing it inside. Basically all I did was stuff the cuttings into some plastic pots with clay hydroponics substrate that I wired up to sit on the top of the tank and then let nature take over. Only one cutting ended up rooting and taking off, but boy has it grown. Here it is 20 days ago, finally getting its first fruits. The roots are on the other side of the glass tank cover. The light source is a AquaUFO + Red LED fixture. 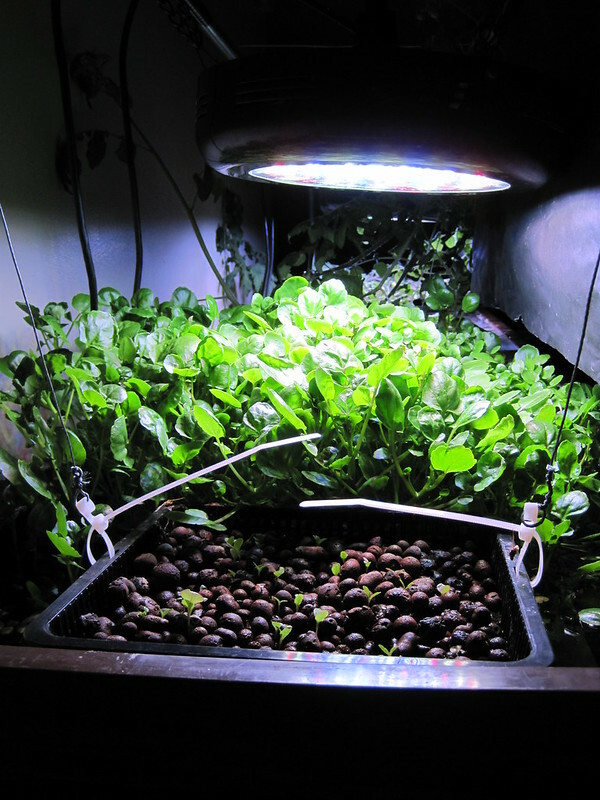 On the other side of the tank I have my giant mass of watercress and some Garnet Rose Lettuce starting. 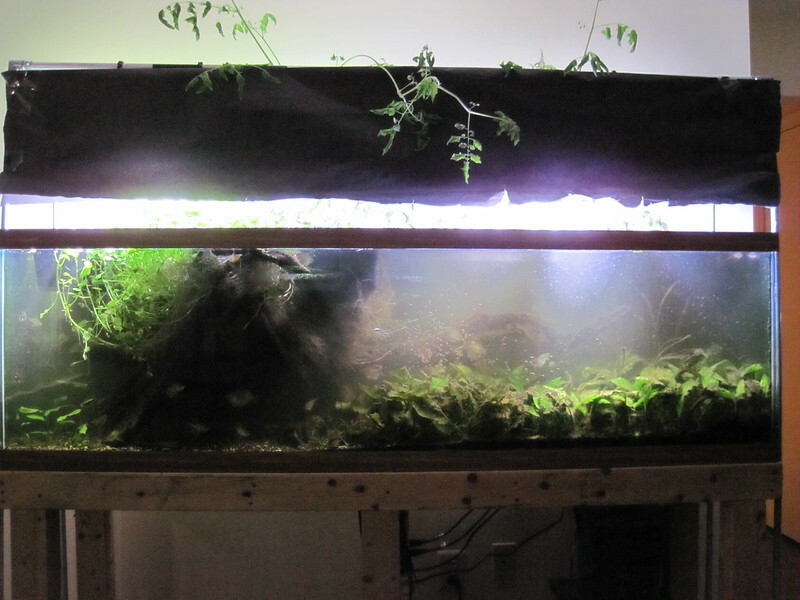 Here’s a picture of the whole tank. We’ve got the top wrapped with black paper because the LEDs are so bright that they make tv watching impossible. They’re also pretty uncomfortable to look at directly, although not dangerously so. Please excuse the state of the tank as I really needed to clean the filter before I took this picture. The aquatic plants at the bottom aren’t edible and have been in there for years. It’s mostly a mix of cryptocorynes and tiger lotus (Nymphaea lotus) as that seems to adapt best to the constantly changing light conditions and my lack of attention. Twenty days later, we’re really cooking now. 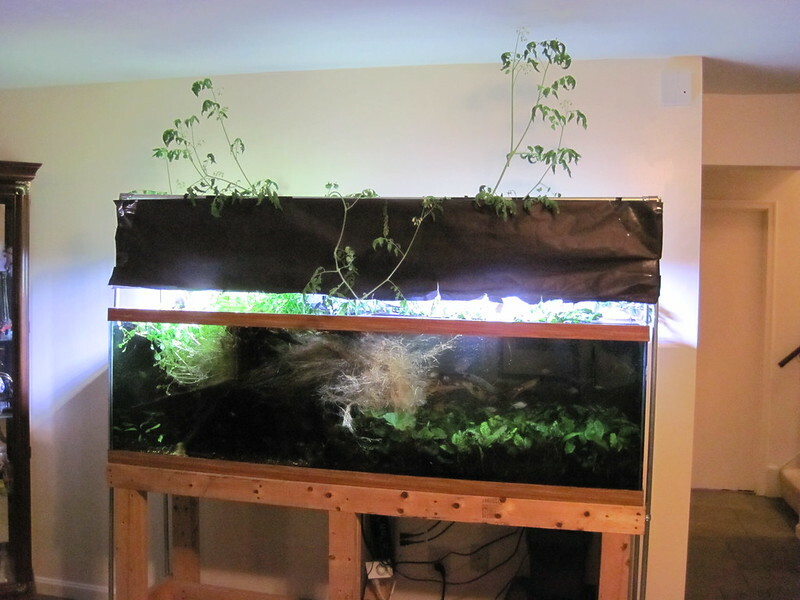 It’s a bit hard to compare because the lighting conditions make photography tricky, but the tomato plant now spreads from one end of the tank to the other and has branches up to almost the ceiling. I did clean the filter so there’s less murk. 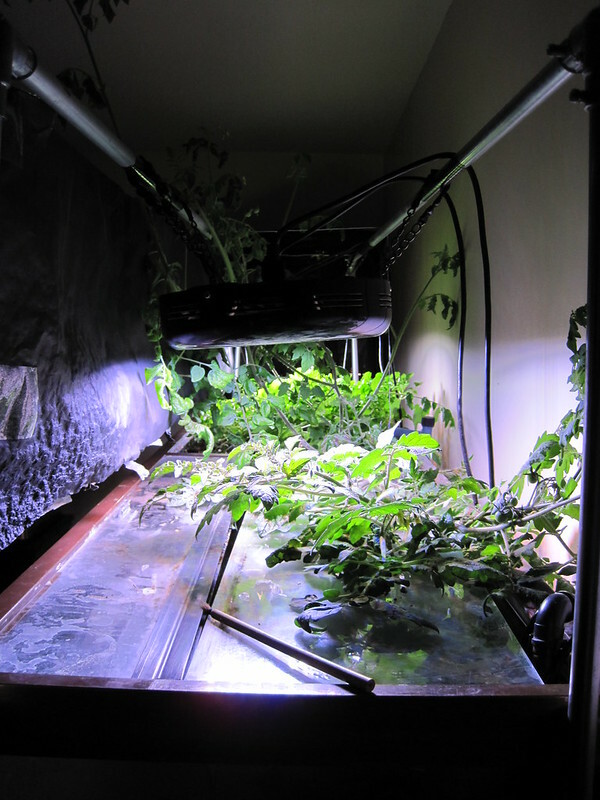 I also had to change the position of the powerhead I have in the tank so it’s blowing the root ball of the tomato to the front of the tank. Makes for a somewhat less attractive showcase tank, but it’s fun to watch the fish hunt for food and spawn in the roots. My diamond tetras reproduce in the tank pretty regularly. I have less fry lately because of the addition of some more predatory fish, but eventually they’re going to be too big to comfortably be able to fit in all of the root structures and I’ll see more fry again. 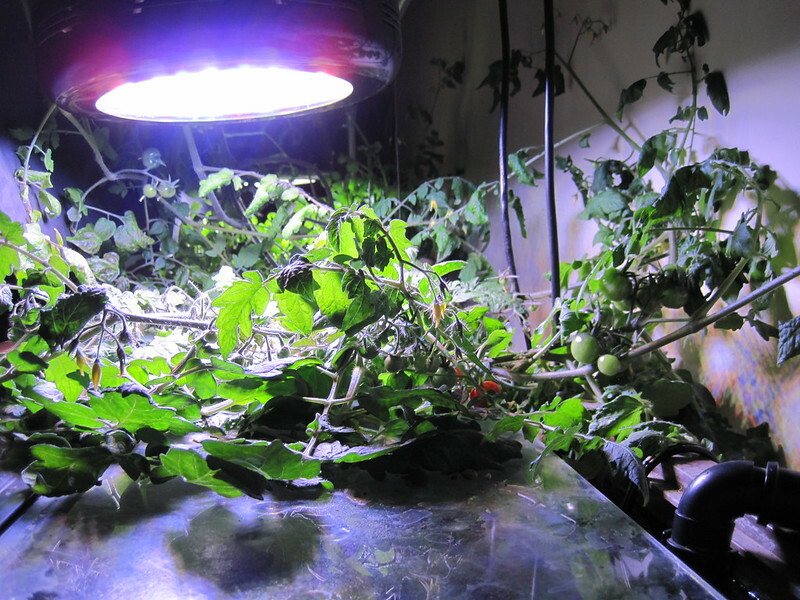 Behind the light guard, you can really see how the tomato plant is covering the top of the tank. I’ve got tons of flower, young fruit and two ripe tomatoes! Jason tasted one of the tomatoes last night (because I don’t actually like them!) and said it was a completely perfectly ripe tomato with excellent flavor and sweetness. I am very excited to have them continue to succeed! 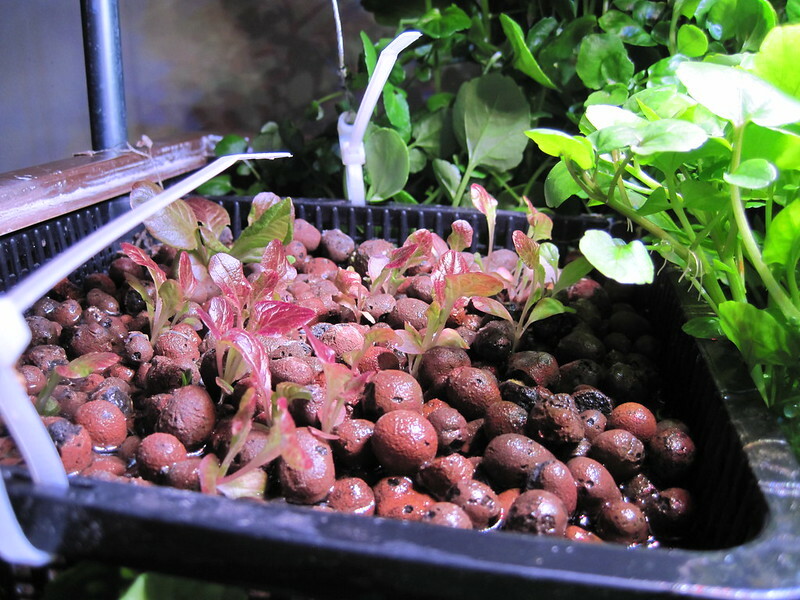 On the other end of the tank, the Garnet Rose Lettuce is starting to leaf out and turn a beautiful red. This is a new breed for me and I’m looking forward to tasting it. If anyone has questions about fish stocking, feeding, or any other specs, let me know.